Big banks are partying like Jamie Dimon himself was just elected president. Since Donald Trump's surprise victory, bank stocks have helped carry the market to new heights. The rally has been underpinned by higher interest rates but it also represents a bet that Trump will reduce big banks' regulatory burden. Dimon's bank JPMorgan Chase (JPM) has soared 11% since Election Day. Goldman Sachs (GS) stock has raced up 16%, while Bank of America (BAC) has surged 19% and is now on track for its best month since 2012. Even Wells Fargo (WFC), just two months removed from its fake account scandal, is up 14% since Trump defeated Hillary Clinton. The post-election bank euphoria suggests that investors have forgotten, or are willing to overlook, Trump's anti-Wall Street stance and populist tone on the campaign trail. Few seem to recall that Trump advocated for breaking up big banks by reinstating the Depression era law Glass-Steagall. And the President-elect has named as his top strategist Steve Bannon, a Wall Street critic, who has blamed the 2008 global financial crisis on greedy bankers. Bannon also took issue with the fact that none of the bank execs faced criminal charges. "There is much more risk to the biggest banks than the market appears to appreciate," Jaret Seiberg, a Cowen & Co. analyst, wrote in a recent note. Seiberg urged "caution" for those who assume Trump will be a friend to big banks. In fact, he said some reforms could help regional banks at the expense of mega banks. "It remains unclear if the Trump administration will turn pro-big bank...or revert to its campaign stance of being anti-Wall Street," Seiberg wrote. Wall Street seems to be banking on Trump's ability and willingness to repeal the Dodd-Frank financial overhaul. Doing that would relieve banks of rising regulatory burdens. But Chuck Schumer, the incoming Senate minority leader, said on NBC's Meet the Press on Sunday that he's got the votes to block any attempt to repeal or roll back Dodd-Frank. Others wonder if Trump wants to follow through on this promise, pointing to how unpopular it would be with the Rust Belt voters of Ohio and Pennsylvania who helped fuel the billionaire's rise. 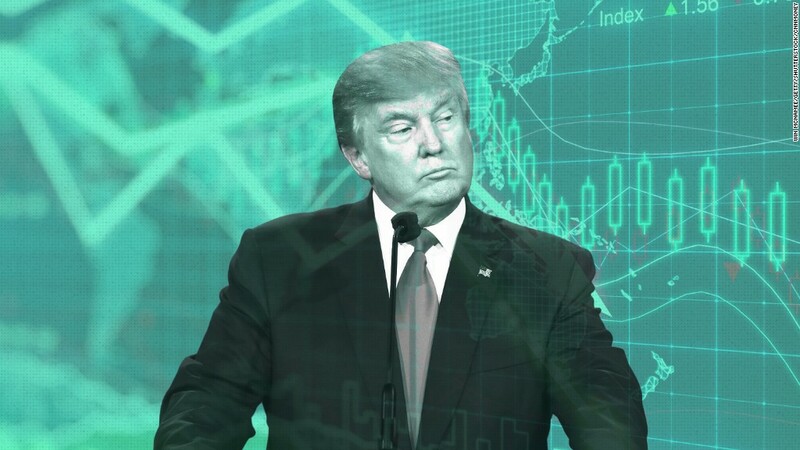 "They didn't vote for Trump because he was going to kickstart the CDO market," Michael Block, chief market strategist at Rhino Trading, wrote in a recent note, referring to complex Wall Street securities that played a role in the financial crisis. "They voted for him for quite the opposite reasons, frankly. How soon we forget," Block wrote. James Fotheringham, analyst at BMO Capital Markets, warned investors to "curb your enthusiasm" about bank stocks. Fotheringham does believe big banks will face less regulation due to Trump's victory, but he warns in a report that "Trump's election promise to 'repeal Dodd-Frank' will prove an empty one." BMO also warns that alternatives to Dodd-Frank could hurt big banks. For instance, Jeb Hensarling, chairman of the powerful House Financial Services Committee, has championed the Financial Choice Act. The legislation would be a "negative" for big banks because it would encourage them to bulk up on lots more capital than they currently have. Targets in Hensarling's legislation suggest "significant capital shortfalls" for JPMorgan, Wells Fargo, Bank of America, Citigroup, Goldman Sachs and Morgan Stanley. The biggest wildcard of all would be if Trump carried out his campaign promise to bring back Glass-Steagall, the Great Depression-era law that bans banks from serving both Wall Street and Main Street. Such legislation, which the GOP included in its official platform at Trump's urging, would force mega banks like JPMorgan and Citi to shrink themselves. The cries to shrink big banks may only grow louder after a new Financial Stability Board report this week concluded that Citi (C), Wells Fargo and Bank of America all pose a greater risk to the financial system than they did last year. "Critics will argue this proves Dodd-Frank did not end too big to fail," Seiberg wrote. He added that it will fuel support for structural changes such as restoring the Glass-Steagall separation between commercial banking and trading. Bannon, Trump's chief strategist and one of the architects of his election upset, appears to be in favor of just that. Bannon told Buzzfeed two years ago, "You really need to go back and make banks do what they do: Commercial banks lend money, and investment banks invest in entrepreneurs and to get away from this trading."